If you are renovating your home, you cannot go wrong with installing iron doors Houston TX. These doors make a huge impact on how others see your home. They can bring a lot of curb appeal, increasing your home’s value. Iron doors come in a wide variety of styles. This selection gives you the ability to choose the perfect door for your project. Some homeowners have concerns about wrought iron door prices. Wrought iron is heavier and can offer more security. As a result, consumers might think these doors are very expensive. If you find the right retailer, these doors can be quite affordable. Learning how to care for and maintain them will ensure your investment lasts. When looking for doors, ask each supplier a few questions. These questions will give you a good idea about the quality of the products. They will also help you learn how to maintain your door for years to come. 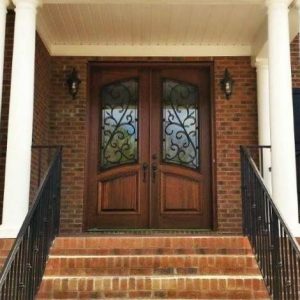 Customers looking for wrought iron exterior doors should call Southern Front. They have a wide selection of exterior and interior doors in many styles. You are sure to find the iron door of your dreams at Southern Front Stained Glass and Doors. They can ship to locations across the U.S. and Canada. Visit Southern Front online to view their catalogue at http://www.southernfront.com. Customers can also call Southern Front at 281-890-5860. They are happy to answer your questions about their products and their store. Question #1: How Are Your Wrought Iron Interior Doors Made? It is very important that you know what kind of material each door contains. Wrought iron interior doors often incorporate other elements like wood and glass. You should know the type of wood used as well as the thickness of the glass. Disreputable companies will use cheap wood panels instead of solid wood. They may also try to use thin panes of glass, resulting in a weak and inferior door. When you ask about composition, ask about the type of wood as well. There are many types of wood that are suitable for interior doors, so there is no wrong answer. It is important information to have so you can figure out how to keep it clean. Some chemicals are harmful to some types of wood, so it is good to know what to avoid. Prospective customers can contact Southern Front at 281-890-5860 to learn more. Southern Front is happy to answer questions about the composition of each of their doors. You can also find product information online by visiting http://www.southernfront.com. They carry a wide selection of wrought iron doors, as well as fiberglass and solid wood. Question #2: What Are Your Custom Wrought Iron Door Prices? If you do not find the wrought iron door you were hoping for, ask about custom options. Custom doors are the perfect way to get everything you want without any elements you dislike. They are often not as expensive as many customers believe. Ask about custom wrought iron door prices early on. This way you can start thinking of your custom door if you do not see a pre-made one you love. When looking for doors, make a list of the qualities you like and the ones you do not like. This will help you and your sales representative find custom solutions that work. Browsing and ordering from the same company can save you a lot of time. You may even be able to identify what you like in particular door models. This will give the retailer a very clear idea of what you want. Southern Front is proud to offer custom doors spanning a variety of styles. They want all their customers to go home with doors they love. As a result, they will work with you to find the perfect custom solution for your home. You can view their pre-made doors at http://www.southernfront.com. Prospective customers can contact them by phone at 281-890-5860 to discuss custom options. Question #3: What Is The Best Way To Clean Wrought Iron Exterior Doors? Asking about the best way to clean wrought iron exterior doors is the best way to keep them looking like new. These instructions may vary depending on the type of materials used. For example, certain types of cleansers will stain certain types of wood. In other cases, some chemicals will cause the iron to oxidize. Take a few moments to ask the sales staff about cleaning and care. This will lengthen the lifespan of your door, and maximize your investment. Generally speaking, you can clean most exterior doors using warm soapy water. Gather a few microfiber or other soft cloths and a bucket of water. Wipe down the iron and wood with the cloth every few months or as needed. Be sure you use a clean cloth to dry off the door afterwards. If you have glass, spray the glass cleaner onto the cloth itself rather than on the door. This will reduce the risk of cleanser staining the wood or deteriorating the iron. Customers looking for iron doors can visit Southern Front. Their staff can help you find the perfect door for your home. They will also ensure that you know how to keep your door looking like new for as long as possible. Visit Southern Front in store or online at http://www.southernfront.com. You can also contact Southern Front by calling 281-890-5860. There is a lot more to keep in mind aside from wrought iron door prices when shopping for a new door. Pricing information is important, but so is composition and maintenance. Upgrading your doors can be a big investment for some families. Learning how to make that investment last is crucial. Southern Front has a wide variety of high quality doors available. Their doors are well made, and they are happy to discuss composition with customers. You can call Southern Front at 281-890-5860. Prospective customers can view their products in store or online at http://www.southernfront.com. Southern Front ships to locations across the U.S. and Canada. If you are searching for iron doors Houston TX, you cannot go wrong with Southern Front.